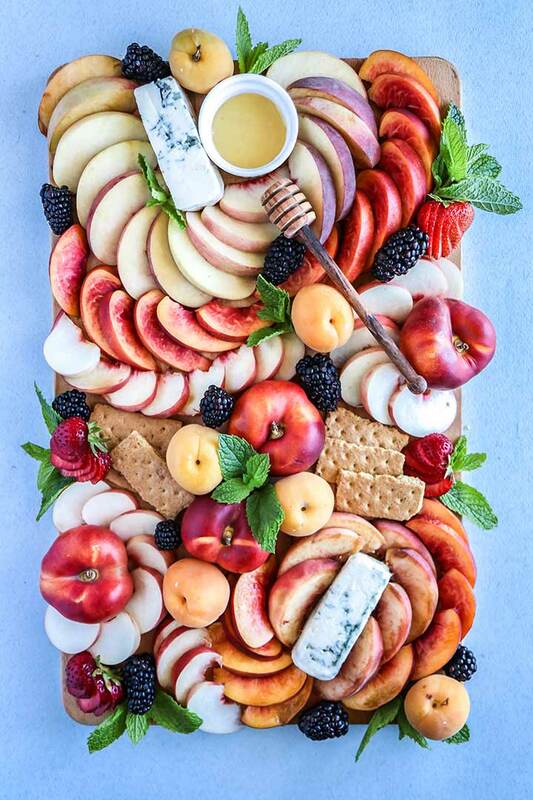 Summer Stone Fruit Cheese Platter, a summer fruit spread of peaches, nectarines and apricots with strong blue cheese and wildflower honey. If I had sum up summer in one fruit it would be stone fruit. Ok, so stone fruit it technically a category of fruit and not one single type, but how in the world could you choose between them? 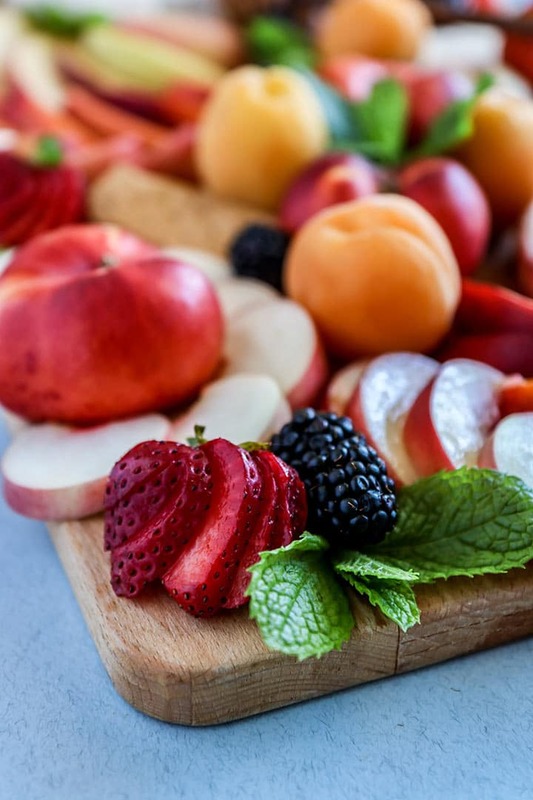 Peaches, nectarines, plums, pluots, apricots, cherries…the list goes on and one but one thing is clear: stone fruits are synonymous with summer. 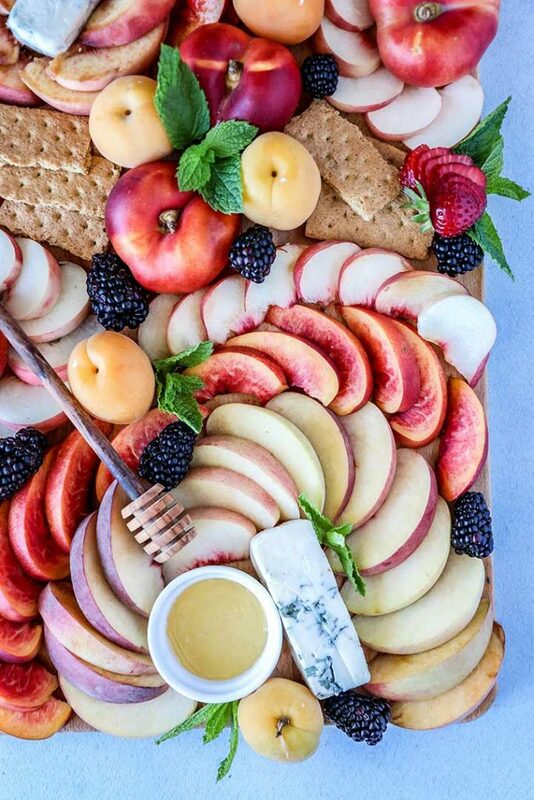 This Summer Stone Fruit Cheese Platter is the second in my monthly platter series (see last month’s Summer Crudite Platter). 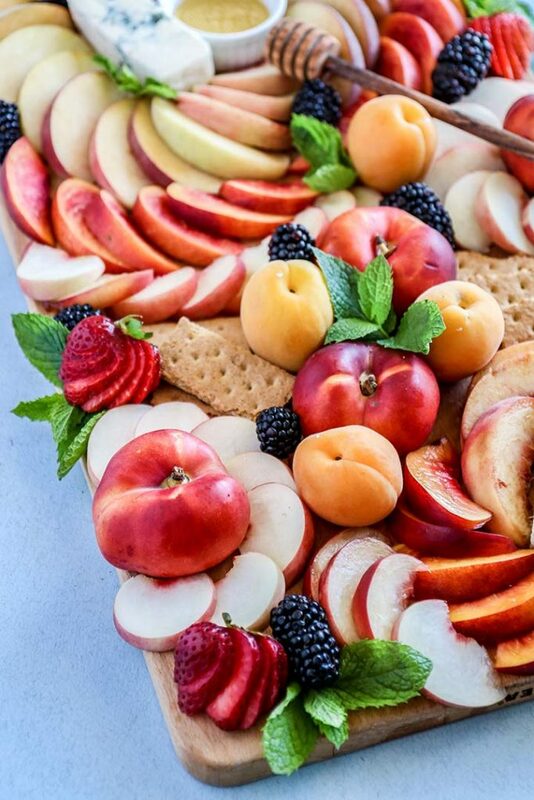 Each month I create a platter or spread featuring fresh, seasonal fruits and vegetable to inspire you to eat seasonally. 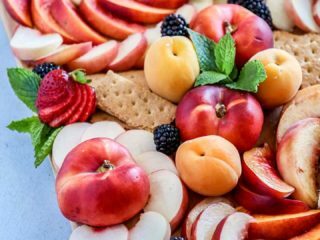 When thinking about this month’s platter I decided to focus on fruit because of it’s abundance in the month of August and it was clear there could be no other focus than an array of stone fruit goodness. But to be honest this platter was really inspired by a random jar of raw Montana wildflower honey I bought at a local market. We had run out of honey the week before and saw this small jar with a handwritten label and I knew I needed to try it. Someone scribbled “Michael’s Montana Wildflower Honey” and drew a flower, and even though I’ve consulted Google I cannot find this brand for the life of me. And guess what? It’s the best honey I’ve ever had, hands down. So because I came across this gem of a grocery find I quickly needed something to actually use the honey on and the seed of an idea for this platter was planted. I like to think that Michael is out there somewhere walking through wildflower fields in Montana and collecting honey for me to enjoy. 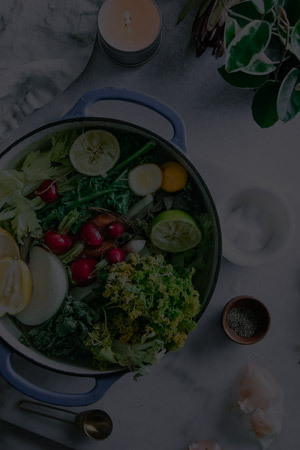 While I unfortunately was unable to find the exact honey I am currently spreading on everything, I’ve tried both Y. S. Eco Bee Farm honey and Nature Nate’s and they are both great brands. Do you have a favorite honey brand? I am known to usually go for the store-bought, teddy bar bottle but every time I buy fresh, wild honey I always say I’m never going back. And then I have to rediscover how delicious it is each and every time I forget. 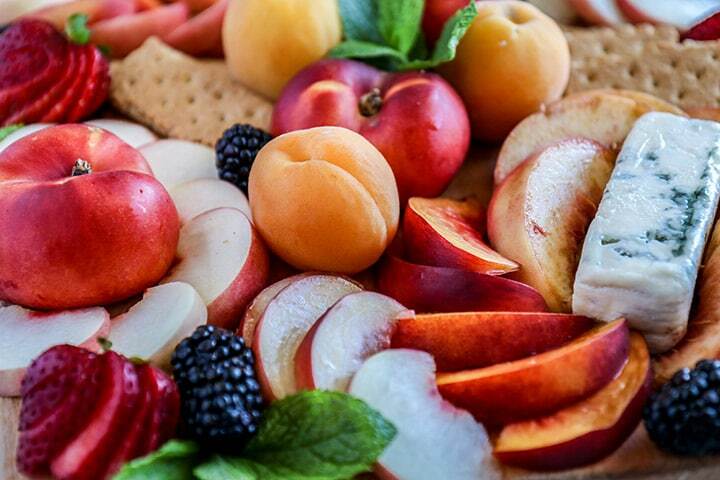 Slice all stone fruit and arrange on tray with blue cheese, crackers and a side of honey or other sweet dipping sauce. That’s it! Yes, it really is that easy. 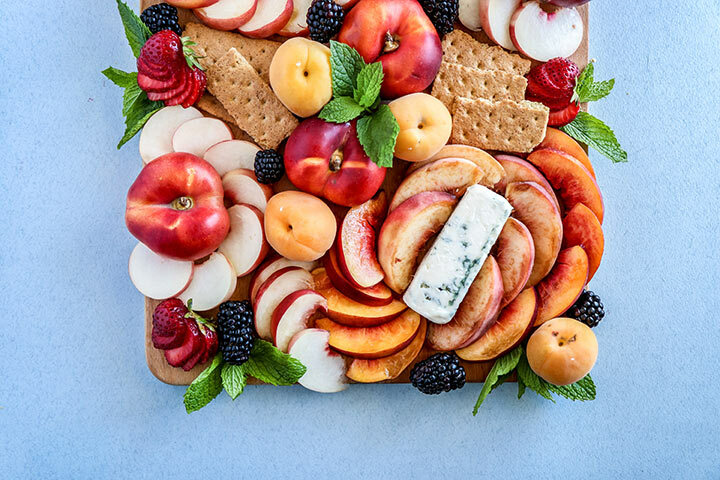 Digging this Summer Stone Fruit Cheese Platter? Such a gorgeous tray of food! I love putting together a good cheese spread!